Thousands crowd New York’s Times Square to see the old year out and the new year in – according to man’s annual calendar. Mobile, Alabama competes with New York with its New Year’s moonpie drop! This year was the third year in a row that Mobile has had its "moonpie drop" at midnight on December 31st. Moonpies are calorie laden marschmallow creme pies popular during the Mardi Gras parades here. 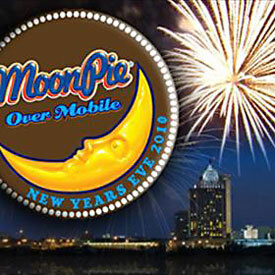 Fred Richardson is the Mobile city councilman who created "MoonPie Over Mobile" to usher in the new year. At the stroke of midnight, a giant electronic MoonPie was dropped from the 34-story RSA BankTrust Building, Mobile’s tallest building. The year prior to the first moonpie drop, 500 people were in Mobile’s downtown area to usher in the new year. When the first moonpie drop took place 3 years ago, a crowd estimated at 25,000 showed up, and this year it was 40,000 despite a tornado watch and rainy weather. Within a minute of the moonpie completing its descent to mark the start of the new year, a state-of-the-art laser show blasted off, along with four synchronized fireworks displays. People who came early were also treated to a Mardi Gras parade. The Mardi Gras season traditionally ends on "Fat Tuesday" and was first celebrated in the USA right here in Mobile in 1703. I missed all the fun, though – I was home asleep!